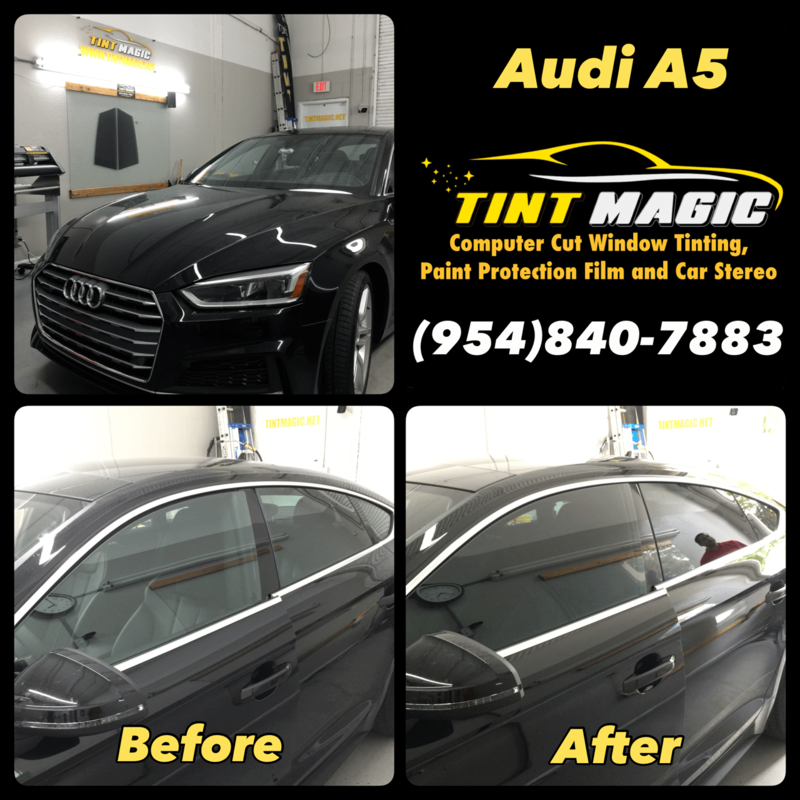 Audi A5 at Tint Magic Window Tint Coral Springs. we use computer cut software for a perfect fit. We are located at 11344 Wiles Rd. Coral Springs, Fl 33076. Blending hatchback versatility, sedan spaciousness, and coupe styling, the A5 Sportback is a masterstroke by Audi. Under the hood is a turbocharged 2.0-liter four-cylinder that makes 252 horsepower. A seven-speed dual-clutch automatic and Quattro all-wheel drive are standard. Handling is precise, and the A5 Sportback is as graceful as its appearance suggests. For the tech savvy, there’s automated emergency braking and a 7.0-inch infotainment system with standard Apple CarPlay and Android Auto. The Sportback is 1.6 inches lower in overall height than the A4, but all other dimensions are within a fraction of the regular sedan’s. Mechanically, the cars are identical, which means the Sportback is powered by a 2.0-liter turbocharged four-cylinder rated at 252 horsepower and 273 lb-ft of torque—the same as in all A4s other than the Ultra.